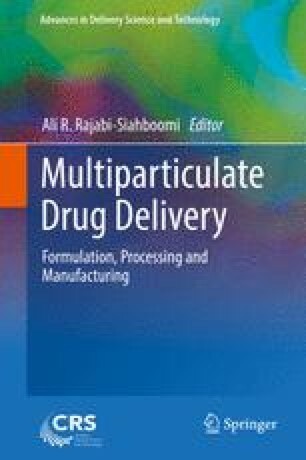 This chapter explores the feasibility of formulating drugs as multiparticulates for children. The paediatric population is diverse and ranges from preterm infants to teenagers between 16 and 18 years of age. Salient physiological differences exist within this population as compared with adults which translate to significant changes in pharmacokinetic characteristics of administered drugs. Thus paediatrics should not be treated as ‘miniature’ adults requiring simple dose reduction during drug therapy administration. Factors such as physiology/drug pharmacokinetics, child capability, duration and frequency of therapy, convenience and acceptability as well as impact on caregivers must be considered during choice and design of paediatric dosage forms. Multiparticulates are solid dosage forms containing small discrete spherical subunits <2.5 mm in size, with each unit displaying characteristic functionalities that are independent of other subunits. Multiparticulates present a versatile and convenient dosage form with multiple applications such that they can be sprinkled on semisolid meals for younger children, or compressed into fast disintegrating tablets for older children. Major considerations during paediatric multiparticulate drug development include palatability and taste masking since these are oral dosage forms that release the drug in close proximity of the taste buds, robustness of coatings that give each subunit its individualised functionality, safe use of excipients as well as the ease of extemporaneous preparations where individual dose titration may be required. The World Health Organization (WHO) has proposed a paradigm shift from the use of liquids to age-appropriate solid dosage forms for paediatrics, and this may result in an increased number of approved multiparticulate paediatric formulations in the market. Cram A, Bartlett JA, Heimlich J. Oral multiparticulates as a flexible solid dosage form approach for paediatric use. Bio Pharma Asia. 2013. https://biopharma-asia.com/magazine-articles/oral-multiparticulates-as-a-flexible-solid-dosage-form-approach-for-paediatric-use/. EMA. Reflection paper: Formulations of choice for the paediatric population. 2006. http://www.ema.europa.eu/docs/en_GB/document_library/Scientific_guideline/2009/09/WC500003782.pdf. Accessed 14 Apr 2014. Guidance for industry, bioavailability and bioequivalence studies for orally-administered drug products—general considerations. Us department of health and human services food and drug administration center for drug evaluation and research. 2003. https://www.fda.gov/ohrms/dockets/ac/03/briefing/3995B1_07_GFI-BioAvail-BioEquiv.pdf.